You can now create bridges where trucks can move, without having to place blocks under the tracks. Rail Bridges 1.7.10 is a fairly simple mod that lets you create bridges using new types of rails. These new rails act as bridges literally, ie not have to create anything underneath to make a bridge where trucks can move. However… not everything is be perfect in this life, by now these mentioned new rails don’t have curves, that is, so it is only possible to make straight lines using these rails, but you can use normal rails for curves and make connect them to the bridges as normal. Although it may seem silly, but those who have had to railway bridges in Minecraft, have desired to have this function for sure. 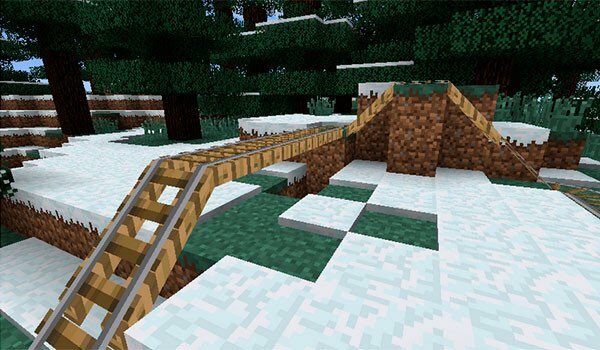 How to install Rail Bridges Mod for Minecraft 1.7.10?